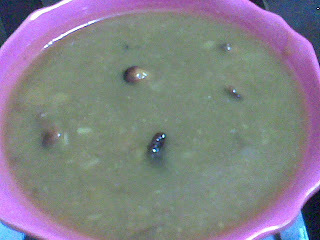 Paruppu Payasam has always been an often made Neiveidhyam in my household. My grandmother used to get up early in the morning have her head bath and start preparing the Neiveidhyam to be offered to Goddess Durgai Amman especially on the Fridays of the Aadi month which happens to be very auspicious. Then my mother followed her footsteps and now it is my turn to inculcate those values in my children. Though in Chennai this month is contributed to various sales to whatever you across, be it clothes, jewellery or even computers this month will always have me remembering those poojas performed during the raghukalams on the Fridays and Sundays mingled with the agarbathi and the flowers fragrance. In a kadai heat ½ tbsp of ghee and fry the yellow moong dal and the channa dal till they slightly turn color. Pressure cook the dals to 3 or 4 whistles and keep aside. Grind the grated coconut along with the elaichi to a fine paste and keep aside. In the same kadai heat the remaining ghee and shallow fry the cashew nuts till they turn golden brown. In another vessel take the grated jaggery and pour water till it gets fully covered. Boil it till the jaggery completely dissolves. Pass this thru a colander to filter it of any impurities. No need to boil it to a one string consistency. In a kadai mix both the jaggery liquid and the cooked dals and bring to a boil. Add the coconut and elaichi paste and cook for ten minutes. Never add the milk while the kheer is cooking because sometimes it might curdle. Take it off the flame and the fried cashews. Now add the milk to the payasam, mix well and serve either hot or cold. 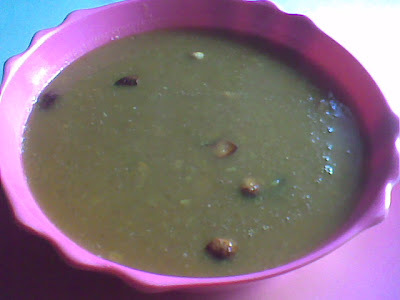 This tasty and healthy payasam goes to the Sweet Series hosted by Mythreyee.